I love books. (I better for all the time I devote to reading and blogging about them.) But I have mixed feelings about getting books for Christmas. More specifically, I have mixed feelings about other people buying books for the express purpose of giving them to me. I don't know if I'm the only one who feels this way, but when someone has specifically picked a book for me and spent money on it (especially list price), I feel absolutely AWFUL if I don't like it. It's like that person just wasted $5-$20. Now, let's be honest, a good number of the books I buy turn out to be "okay" or bombs. But it's different when I wasted money on a bad book as opposed to someone else wasting money on a bad book because he/she thought I would like it. Does that make sense? What about you guys? 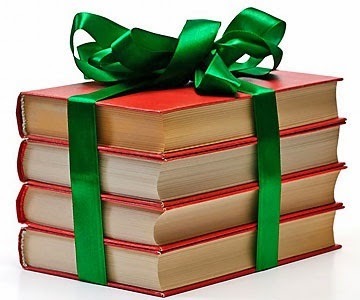 Does anyone else have Christmas book giving/getting anxieties? I have never had that happen; books that they don't know I like? Weird. My grandma used to do that with music though, strange tapes. My wife doesn't know what to buy me for Christmas anymore though since I started blogging; she used to rely on books and now I have many of the ones she would have considered already. Folks used to buy me books for xmas and birthdays but now they know that I mostly receive books from publishers and the ones i don't get I usually buy for myself (or I put them on my wishlist) so they can always look at my wishlist for ones I haven't immediately bought - but then those ones likely never end up read because there are so many more books before them. I do NOT like it when people pick books for me THEY THINK I'll like because they are almost always wrong. When other people I now recommend books to me again I really don't ever read them because so many of them read best sellers in the fiction genre or Oprah book club picks or books they see in a magazine meaning they almost always are not fantasy or science fiction and I just don't have interest in books outside my preferred genre. Now a days I ask for craft store gift cards or I ask folks to look at my wishlist where I place supplies that I really want for my hobbies that aren't reading. So I do feel your pain on the books. I am however not ashamed to ask for receipts so I can return them and get store credit to buy something I would read instead. Yeah, picking up a book from a genre you don't read doesn't make a lot of sense. Not that there aren't exceptions to every rule, but for a Christmas/birthday gift? I don't like the odds on that. Directing their good shopping intentions toward other hobbies is a great idea! And you are seriously brave to ask for receipts. I always feel horrific asking, even when the person has already mentioned keeping it just in case. I love getting books as gifts! *giggles like a kid in a candy store* Most people usually ask me for ideas for birthday or Christmas gifts, so I give them specific titles I'm looking for. Unless they know my tastes reeeeeallllyyyy well (and only my closest friends do), they'll pick up what I ask for, not something they hope or assume I'll like. That's not a bad idea! Although I'm still a little amazed that no one has my paranoia about not liking a book, especially one you specifically request. Maybe I've been burned too many times by books that look like my thing on paper but then don't pan out? I tend to feel a little bad if a book someone buys me ends up being one I didn't like. However, it also depends. Since I have a wishlist, and I give out the link to said wishlist to all family members and friends who I think are likely to buy me stuff, if they buy me something NOT on said wishlist, I feel less bad about not liking whatever the book was. I kind of feel like, if they couldn't find a single book on my nearly 300 book wishlist, then they obviously weren't actually trying. Since very few are out of print, and I'll read ebook or print copies, getting a book that isn't on that list or is from an author I've never heard of (or whom I haven't liked in the past) makes me think they didn't really care enough. That they were more "Oh she likes books, let's just grab this one!" I'm grateful to have gotten anything of course, it just seems most years like my family tends to forget and then scramble for a "just grab something" gift. I'm sure it's not actually true, but when your lists are ignored it sure feels that way. Wishlists can definitely be helpful! Especially when they're that long, so there's still an element of surprise when you get a book from it. I love this topic! I was at first requesting only books for holidays, but then I got all the presents that I was expecting and realized that I like being surprised by presents and books are not something I really want to be surprised about since I probably have already decided whether or not I want to read a book if it is new >.> Also I always worry that if people just pick something, I'll have already read it or already own it <.<. But mostly I feel bad when I don't get to reading it right away D: I have books that the boy gave me for our first x-mas that I STILL HAVEN'T READ! WHAT IS WRONG WITH ME??? I don't like getting books as gifts unless the person knows what they're doing, like last year when my husband spent a lot of time going through my Amazon and Goodreads accounts and figuring out what I already had and what I still wanted. He also knew that I prefer reading on my Kindle and bought those instead of physical copies. I give away almost all physical copies of books when I'm done reading them, so buying me a physical copy that I'm just going to get rid of soon makes me feel guilty. I love getting books for christmas/birthdays! But I also love getting beauty things like makeup and concert tickets so I only get a few books if any at all! I do have the problem of worrying that I won't like a book so if I asked for books for christmas I usually give the person a list and let them choose as many or as little from the list as they want (all paperbacks and none over £7 each) which works out well for everyone involved because apparently i'm pretty hard to shop for.